Oh the dresses! I'm starting to get used to this you guys, my collection of dresses is growing and growing and I must confess I'm getting addicted to them, they are so comfy and fresh and sevenwondersthelabel.com has the most adorable pieces, I want every single item from their store. I felt like an explorer with this look and it's definitely something I would wear every-day don't you agree?. Another thing I've been loving and wearing a whole lot lately is the rattan bag, from Lokatan whoever invented this style/trend is a genius, it's GORGEOUS! and goes well with pretty much everything, do you have one already?. Oh los vestidos! Estoy empezando a acostumbrarme a esto chicas, mi colección de vestidos está creciendo y creciendo y debo confesar que me estoy volviendo adicta a ellos, son tan cómodos y frescos y sevenwondersthelabel.com tiene las piezas más adorables, quiero todo de la tienda. 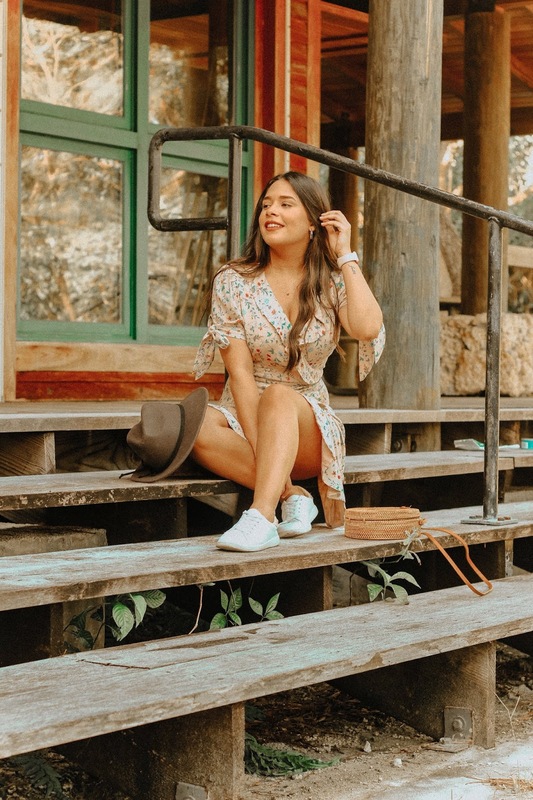 Me sentí como una niña exploradora con este look y definitivamente es algo que usaría todos los días, ¿no les parece? Otra cosa que he estado amando y usando mucho últimamente es el bolso de mimbre, de Lokatan quien inventó este estilo / tendencia es un genio, ¡es HERMOSO! y va bien con casi todo, ¿ya tienes uno? What a beautiful look! Love this. You look very pretty wearing the blush floral print Adeline wrap dress from Seven Wonders! I also like the rattan bag, wide brim hat and white sneakers you accessorised with. I love your outfit photos and the setting. I love everything you wear! So perfect for summer esp your bag!